January is flying by! I honestly can’t believe I’ve been doing this Vegetarian Challenge for almost a month already. Week three went by quickly, as my attention was focused on chaos elsewhere, but I feel like I’m finally getting into a groove with the meal planning. Here’s the week 3 recap! 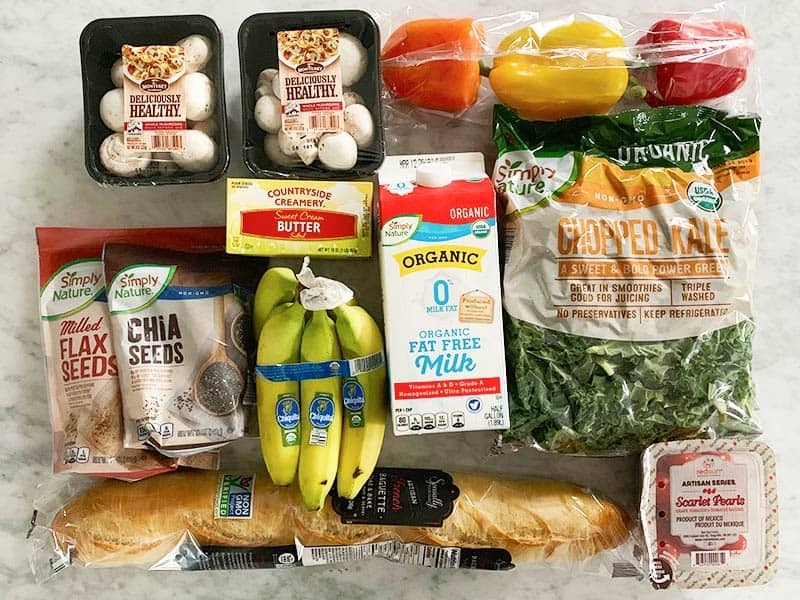 Quick Summary: I’m finally getting a feel for how much food I need to buy and prepare to match my appetite, and I have developed a core group of ingredients that I like to keep on hand for impromptu meals. I’ve had a strong craving for sushi all week, fatty salmon in particular! I battled some pretty extreme stress this week, which made me really want to order take out, but I overcame the temptation. And I feel like a champion because I repurposed a LOT of leftovers this week! 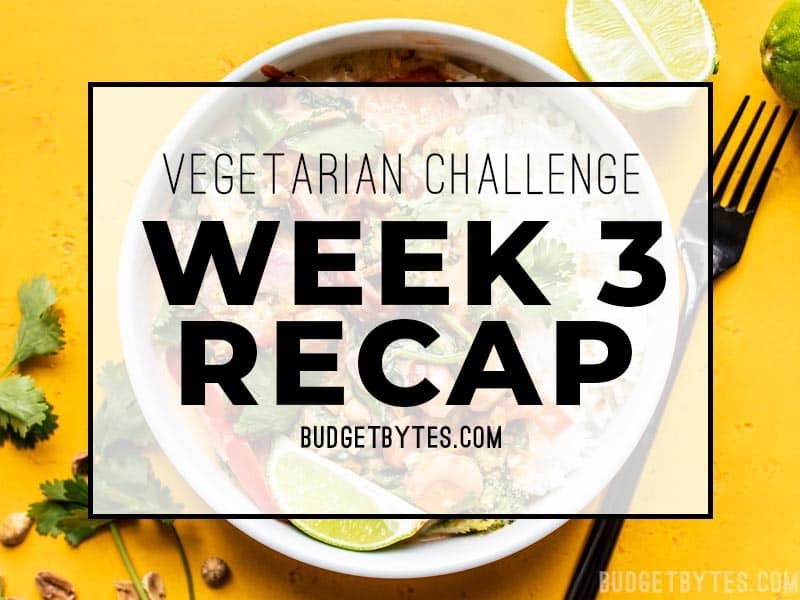 The first two weeks of the Vegetarian Challenge I did my grocery shopping on Monday, and was met with ransacked grocery stores and nearly bare shelves. So this week I waited until Tuesday and had much better luck! I had so much food left over from weeks one and two that my grocery shopping list was super short this week, so I decided to take this opportunity to stock up on some things, like blueberries, chia seeds, and flax seeds. I had a few higher ticket items this week, which led to my highest grocery shopping total for the challenge thus far. What got frozen: I had one serving of the Balsamic Roasted Mushrooms and Herby Kale Mashed Potatoes and two servings of the Sun Dried Tomato, Kale, and White Bean Skillet left, so I froze all three of those with hopes that I would eat them later rather than have them land in the compost bin. I had one banana I didn’t get to either, so I sliced it up and froze that as well (for use in smoothies or adding to my oat bran). I have plenty of Freezer Garlic Bread left and that will help carry me through the next month or two. 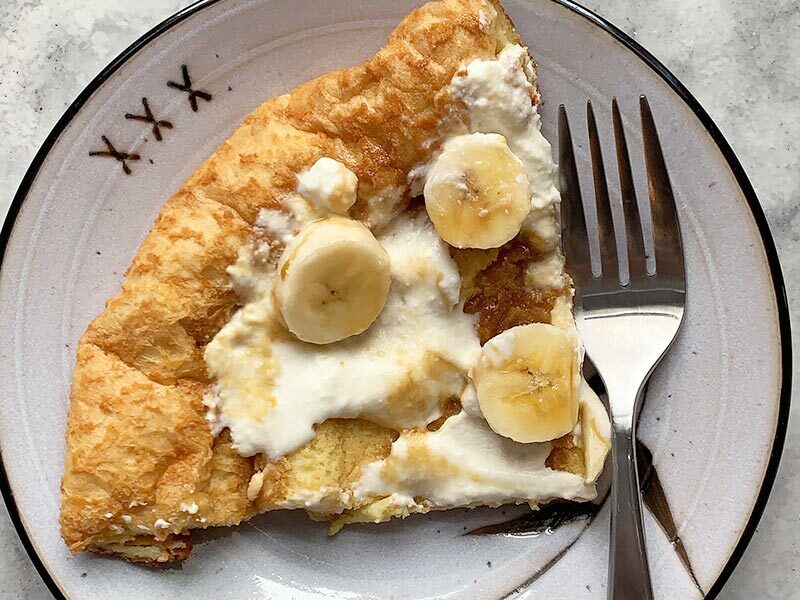 I find one slice of that goes a long way toward squashing my stress food cravings! 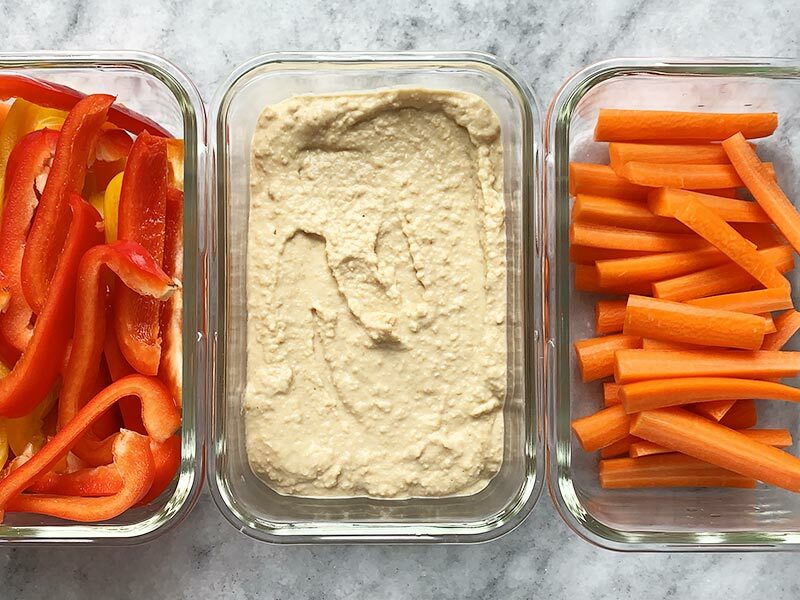 What’s carrying over to week four: I have a couple scoops of hummus left, a few grape tomatoes, and some carrot sticks that I can still chomp on for a few days into week four. I have a little bit of yogurt leftover that is still good, and miraculously I still have an orange or two! What’s going into the compost bin: I had a few slices of bell pepper that I didn’t eat and unfortunately they got a bit slimy, so those have to go into the compost. I’m really happy that I was able to make use of the last two pounds of potatoes that I bought in week one, and the remaining ricotta cheese that I had bought in week two. Using things up instead of throwing them out makes me feel like such a champion! I’m still really enjoying the freedom that comes as a result of planning ahead. Grocery shopping just once per week and knowing exactly what recipes I’ll cook and when has freed up so much of my time. I know the first few days of my week will be super busy with shopping, cooking, and photographing, but the remainder of my week will be pretty chill, and that feels SO GOOD. I’ve also begun to really enjoy being super strict about eating out only once per week. I have to admit that I’ve gotten really lax with that over the last year or so, but when I limit myself to just one meal out per week I enjoy it so much more. It becomes more of an event and is just way more fun. :) I definitely plan to carry this out past January. I don’t have anything from week 3 that I feel needs altering (that means I’m finding my groove! ), so I plan to just keep on truckin’ in week 4. As always, using up leftovers is a high priority! How’s it going for you? What have you learned through your Vegetarian Challenge? I’d love to hear your reflections and lessons, so drop them in the comments section below! 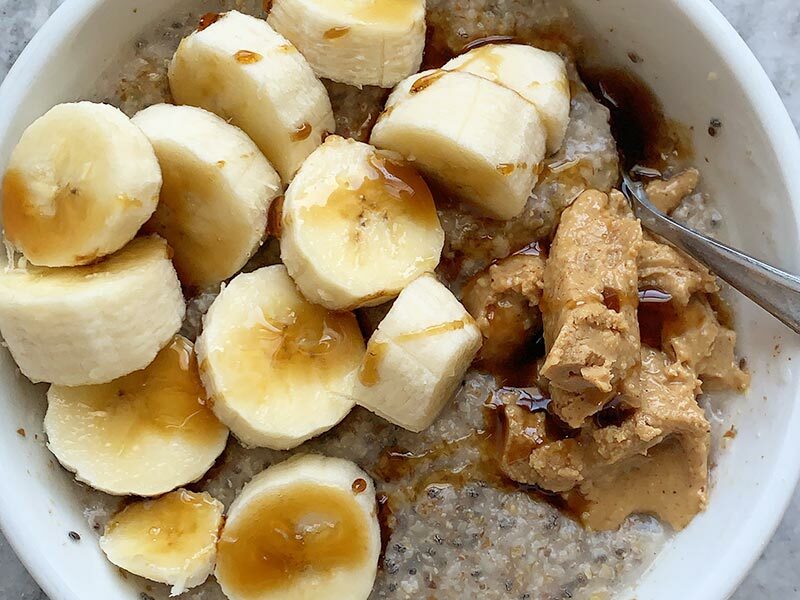 I think that regardless of the vegetarian challenge a lot of people get stuck in a breakfast rut and eat nearly the exact same breakfast most days. I’ve been making a big batch of socca pancakes (with garbanzo bean flour from the bulk bin) then freeze them and for breakfast just rewarm in the microwave and them top with avocado and dressed salad greens or go with nut butter and fruit. This is one of my favourite series of posts! I love the detail you share in each post and your recipes are delicious. I eat vegetarian, but haven’t always, AND I used to work in an incredible sushi restaurant in Chicago, so I will get VERY strong cravings for sushi (especially salmon, as well!). I don’t know if it’s my body telling me I’m deprived of a certain vitamin or protein or if it’s just my brain knowing how good it is! If left to my own devices, I am like a grizzly bear with salmon. I’ll admit that once in a blue moon I’ll get sushi to appease that craving, but I don’t beat myself up about it– I just enjoy it even more! Good luck with the rest of the challenge! I totally see how the monotony of everyday, relatively simple to throw together vegetarian meals can get to you, but always appreciate your honesty and dedication! Hahah, “I am like a grizzly bear with salmon.” Best mental image ever. :) Thank you for that! OH man, it’s so unfair how cheap food is in the states compared to here (Canada). My food bill would be easily 2x that for the same food. Fish is the only thing I “miss” from before I went vegan. Sometimes I still crave tuna fish, but I have found some good alternatives. If you can get a hold of it, Umeboshi vinegar can impart a very fish-like taste to things. I make chickpea/artichoke heart salad in the food processor and adding a few splashes of that vinegar makes it satisfy that fishy tuna craving. You can also make a “smoked salmon” substitute out of tomatoes, apparently, but I haven’t tried this myself. When I was switching to being a vegetarian I almost never had meat cravings, but sushi and tuna salad were the two things that I would consistently find myself craving! So you’re definitely not alone with that. The salmon craving is likely due to some vitamin deficiency, possible B12. The 2/3 of a cup milk everyday plus whatever occasional use of cheese or eggs were included in the recipes was not sufficient. Continued this week with more soup. Southwestern corn chowder (chiles), and a vegetarian version of DH’s favorite chicken tortilla soup–veggie broth, no chicken, but diced tomatoes, onions, celery, green chiles , corn, black beans, and carrots in a fairly thin broth poured over corn tortilla strips, crumbled feta (sub for queso fresco), diced avocado, chopped cilantro. A Texas version–next time we’ll probably add the chicken. DH was on a waffle kick, but since I don’t like carbs in the morning, ate my 1 egg omelets 4 days, yogurt and fruit 2 days, and avocado toast only once. Eggs were on sale for $.77 a doz, so we had mushroom, onion, and spinach quiche for 2 days, and I boiled a few for egg salad sandwiches and DH’s beloved deviled eggs. Snacks have mostly been fruit–grapes, tangerines, bananas, etc–with some cheese and crackers. Homemade hummus and salad meals, including a delicious chickpea salad, and my mom’s midwestern kidney bean salad that includes chopped eggs. This month has certainly saved us money. I’ve had fun reading cookbooks and blogs, and trying some new things. We feel good–purging ourselves of those extra holiday calories and overly rich meals. Although we aren’t missing meat, we aren’t vegetarian converts, but will certainly include more meatless meals in our future. I’m thinking this should be a January tradition for us. looking forward to week 4! Thank you, Beth–for tons of inspiration, great recipes, and wonderful ideas! I am vegan and I veganize your recipes all the time so I am really enjoying this series and don’t want it to end! Not sure if you have a recipe for a poke bowl, but my poke place at the mall has a tofu poke bowl that is awesome! I would love if you created a recipe. I definitely need to develop one! I really like you recipes, but honestly am disappointed with the Vegetarian challenge- only because I feed a family, & the amounts/dishes are not true “dinners”- they lack protein, & seem like more of a side dish than entrée. Keep up the delish recipes, but there is no way one could feed a hard-working family on these meals. This isn’t meant to be a plan for others to follow, since we all have different food needs (and mine are admittedly low). It’s more to show how to work more vegetables into your plan on a budget, how develop a personal meal plan, and make the most of your budget by mindfully using up leftovers, repurposing ingredients, and getting creative. The meal plan for one person versus what is needed for a whole family with multiple people and multiple needs will never equate. For me, the real benefit of this challenge is inspiration–to think about meals in new ways, and adjust to my needs. Had I still a houseful of hungry teens, I might have tried 2 or 3 vegetarian days per week and worked on adapting family favorites into meatless versions, returning to our regular rotation the rest of the week–eating more plant foods overall. Leave meat off pizza, skip bacon at breakfast, or try a meatless chili or pasta sauce. How about Beth’s red pepper and tomato soup with grilled cheese for weekend dinner? Baby steps are best starting new things, and she has tons of wonderful veggie friendly recipes on this site. Beth’s ideas are targeted at folks with limited time who want to save money and eat well. This month absolutely did that–recipes filled with taste and texture. Several jumped complete into our week while others inspired me to use parts and project from there, ie I the mashed potatoes and mushrooms weren’t a single meal–the kale and potatoes with breaded and fried eggplant cutlets ala Bobby Flay because I watched a tv episode while getting my vehicle serviced; mushrooms on toast later on. 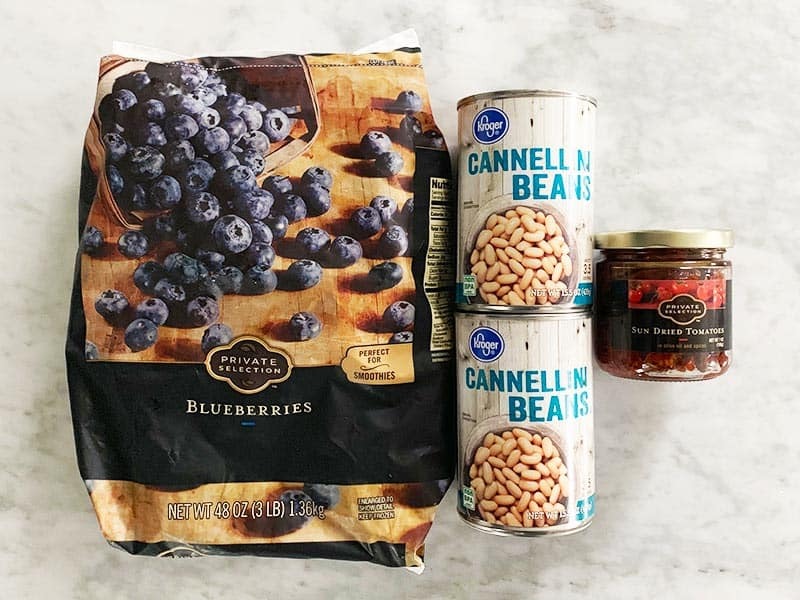 The combo is brilliant and will show up on our table later–maybe with grilled chicken or steak when we return to our omnivore habits, or maybe on its own as a light supper. I feed my hard-working family on these kinds of meals all the time. All it requires is changing one’s pre-conceived notion of what a plate is “supposed” to look like. Thanks as always for the inspiration, Beth! I use your site all the time! I love this series! I’m just wondering though, about some of the amounts you’re eating for a meal. Like the day your “dinner” was a half cup of yogurt with a banana and flaxseed. (Similar meals now and then in other posts as well) Is that generally the amount the average person does or should eat in a dinner meal? Maybe it’s just your appetite, (or maybe I’m missing something) but I’m struggling to apply all the meals/budgets to my life, because it seems like we just eat more than that! Thoughts? Ha – I had the same thoughts. Beth has the portion control down. I haven’t necessarily started eating more, but I definitely eat more than what’s logged. Must just be a difference in appetite, needs, lifestyle, etc.! Yeah, definitely don’t compare what you eat to what I eat. :) We all have very different caloric and nutritional needs, which is why I haven’t published this as a meal plan for other people to follow. I am a small person and unfortunately spend most of my day sitting at a computer, so I don’t have a huge appetite. :) Rather than looking at exactly what or how much I’m eating, look at how I tweak my plan to use up leftovers, squeeze in those extra vegetables each week, and reduce my waste. 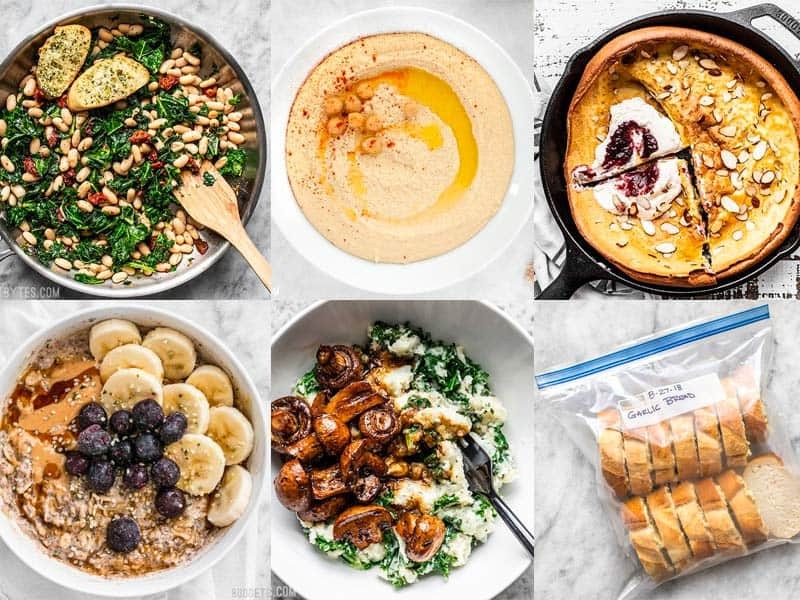 I hope to show that learning to meal plan in a way that fits your individual lifestyle is an ongoing process, and that sometimes there are wins and sometimes there are fails. All this time I’ve been trying to figure out why your recipes never come out as cheap as they’re supposed to. Looking at your receipts, I realize it’s because groceries literally cost 3x as much where I live (Los Angeles)! A pack of grape tomatoes or mushrooms is like 3.99 here! As you can imagine, it’s incredibly difficult to grocery shop on a budget here, and I just want to tell you how grateful I am for your site. 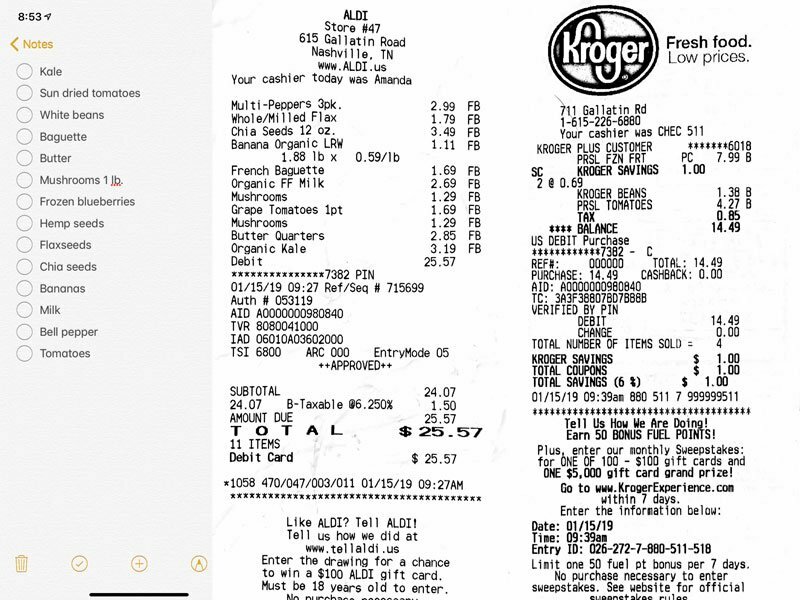 My grocery bills are still through the roof, but nowhere near as high as they would be if I hadn’t found Budget Bytes! Also, and most importantly, your recipes are DELICIOUS! Every single one I’ve made has been a winner! Thank you!! And similarly, I live in Texas where groceries are extremely cheap. I always balk at how expensive things seem to be when I can often make them for close to half of the stated price. However, I discovered a store called “99 Cents Only” which I believe are more common in the LA area so I suggest going to one if you can. I’ve found $7 frozen pizzas there for $1 and they have almost every kind of bean for $1 per pound. Aldi and Trader Joe’s are places to shop inexpensively. In the last few weeks, I’ve been shopping more and more at Aldi’s. The other thing to do is shop specials at your regular supermarket–instead of deciding precisely what you want in advance of shopping, be a bit more flexible. Make your list, but use a general meal plan and fill in with items on sale. For instance, I use canned tomatoes and beans frequently. Two weeks ago, 15 oz cans of diced tomatoes were 5 for $2–I bought 10 cans and won’t even look at canned tomatoes for another 3 months. Most stores have discounted produce on a rack–it may look shopworn, but if you can work that produce into today or tomorrow’s plan, it will be perfectly fine and a great savings. A week ago I saw 3 lbs of roma tomatoes for $1.39 instead of $5+–quite ripe, a few soft, but none spoiled. I made a batch of bruschetta topping, used up a few in green salads and omelets, and cooked the rest for pasta sauce which is now in the freezer. There was also 8 oz of organic baby spinach for $1.29 instead of $4.99–did I ever grab that in a hurry and put it to good use the next day. Yes- this was helpful for me to see the bill too. Even “cheap” stores in my city have prices close to 3x this much as well. Love the recipes though, and feel extremely fortunate to be in a position to not have to worry too much about the cost. I made the chickpea-cauliflower curry tonight with homemade naan and it was sooooo good! Vegetarian sushi might squash the craving! Soy sauce plus wasabi on anything goes a long way towards that, in my experience. Was very nice not to have to meal plan for a few weeks, relying on your work. My favorite recipe of the week was your rosemary biscuits! Feeling really good- and motivated to keep cooking!